Lahore, British India, now in Pakistan. Subrahmanyan Chandrasekhar (Tamil: சுப்பிரமணியன் சந்திரசேகர்) (October 19, 1910, Lahore, British India, now in Pakistan, – August 21, 1995, Chicago, Illinois, United States) was an eminent astrophysicist. Of Tamil Indian heritage, he was born in British India and later became a naturalized citizen of the United States. He served on the University of Chicago faculty from 1937 until his death in 1995 at the age of 84. Chandrasekhar was awarded the 1983 Nobel Prize in Physics (shared with William Alfred Fowler) for his theoretical work on the structure and evolution of stars. Chandrasekhar was the third of ten children born to Sita Ayyar (née Balakrishnan) and Chandrasekhara Subrahmanya Ayyar (C.S. Ayyar), a senior officer in the Indian Audits and Accounts Department in the railway sevices, who was posted in Lahore as the Deputy Auditor General of the Northwestern Railways. Chandrasekhar's mother was devoted to intellectual pursuits and had translated Henrik Ibsen's A Doll House into Tamil. His father was an accomplished Carnatic music violinist who had authored several books on musicology. Chandrasekhar, also known as Chandra, was the nephew of Nobel-prize winning physicist C. V. Raman. Chandra had two elder sisters, Rajalakshmi and Balaparvathi. Being the first son in the family, Chandra’s birth rejoiced his parents, for only the son preserves the family lineage, and to whom all family belongings are bequeathed. The eldest son traditionally assumes his father’s responsibilities once a grown man, and performs certain annual rituals. Following Chandra, his younger siblings included three brothers—Vishwanathan, Balakrishnan, and Ramanathan—and four sisters—Sarada, Vidya, Savitri, and Sundari. Chandrasekhar, a common Tamil name, is one of the appellations of the Hindu deity Shiva and means "holder of the moon" in Sanskrit. At the age of six, Chandra’s family moved from Lahore to Lucknow, Uttar Pradesh, in northern India. A couple years later, C.S. Ayyar became Deputy Accountant-General in Madras, which involved a lot of travel as he was often transferred from place to place. Therefore, he settled his family at a home where they could stay while he traveled. Another individual in the earlier generation of his family, his uncle Sir C.V. Raman, had exhibited brilliance himself, and even won the Nobel Prize. With this example set, Chandra was allowed to choose his own route in life; unlike Sir C.V. Raman, Chandra did not face much opposition from his family in his going away from civil service in India. It was not until 1921, when Chandra was eleven years old, that he attended regular school. He was readily accepted into Hindu High School and skipped two years of normal high school. With such great motivation, Chandra did extremely well in high school. When only fifteen, he started his studies at Presidency College until 1930, obtaining his bachelor's degree, B.Sc. (Hon. ), in physics in June 1930. The principal of Presidency College, Principal Fyson, called Chandra into his office one day. Principal Fyson told Chandra that he was going to be offered a Government of India scholarship to pursue his research in England. This scholarship was created just for Chandra, and was not open for any other applicants. Chandra met with M.A. Candeth (Deputy Director of Public Instruction) and Earlam Smith (former professor of chemistry who became Director of Public Instruction) on February 12, 1930, and on the 15th, he attended an interview with Mr. Subbaroyan, Education Minister of the Madras State Government. The scholarship would be granted to him provided that Chandra agreed to serve either in the Madras state service or at the Presidency College after his return. Also, it would be awarded to him if he completed his honors course and secured the first-class grade. These stipulations were not a problem for Chandra. During the next few months, Chandra put in all his energy to studying for the final examinations. As predicted, he secured first rank, and his grades set a new record. On May 22, 1930, Chandrasekhar was awarded the Government of India scholarship to pursue graduate studies at the University of Cambridge, where he became a research student of Professor R.H. Fowler and was admitted to Trinity College, Cambridge. On the advice of Prof. P. A. M. Dirac, Chandrasekhar spent a year at the Institut for Teoretisk Fysik in Copenhagen, where he met Prof. Niels Bohr. In the summer of 1933, Chandrasekhar was awarded his Ph.D. degree at Cambridge. However, he faced a dilemma: in order to keep his scholarship, he must return to India and take up a position as he promised. Even his father was urging his return to India, since he had been away for three years already. Chandra, on the other hand, wanted to remain in England to continue his research. In the meantime, he applied for Fellowship at Trinity College. Professor Fowler told him of the great competition for the Fellowship, and didn’t think Chandra would be able to get in. Chandra himself greatly doubted his chances, but took the required examinations anyway. But to Chandra’s surprise, the following October, he was elected to a Prize Fellowship at Trinity College for the period 1933-37. He attempted to mollify his father, stating that by being a Fellow, his settlement in India would be much easier, as he would get much more respect from the government, and thus be able to secure a position of his liking upon his return. During his Fellowship at Trinity College, Chandra formed friendships with Sir Arthur Eddington and Professor E. A. Milne. In September 1936, Chandrasekhar married Lalitha Doraiswamy, who he had met as a fellow student at Presidency College, Madras, and who was a year junior to him. In his Nobel autobiography, Chandrasekhar wrote, "Lalitha's patient understanding, support, and encouragement have been the central facts of my life." In January 1937, Chandrasekhar was recruited to the University of Chicago faculty as Assistant Professor by Dr. Otto Struve and President Robert Maynard Hutchins. Here he stayed at Williams Bay, Wisconsin, and Chandra set off on his scientific career at the Yerkes Observatory of the University of Chicago. He was to remain at the university for his entire career, becoming Morton D. Hull Distinguished Service Professor of Theoretical Astrophysics in 1952 and became a naturalized citizen of the United States in 1953. He attained emeritus status at the university in 1985. During World War II, Chandrasekhar worked at the Ballistic Research Laboratories at the Aberdeen Proving Ground in Maryland. While there, he worked on problems of ballistics; for example, two reports from 1943 were titled, On the decay of plane shock waves and The normal reflection of a blast wave. Chandrasekhar worked continuously in one specific area of astrophysics for a number of years, then moved to another area. Consequently, his working life can be divided into distinct periods. He studied stellar structure, including the theory of white dwarfs, during the years 1929 to 1939, and subsequently focused on stellar dynamics from 1939 to 1943. Next, he concentrated on the theory of radiative transfer and the quantum theory of the negative ion of hydrogen from 1943 to 1950. This was followed by sustained work on hydrodynamic and hydromagnetic stability from 1950 to 1961. In the 1960s, he studied the equilibrium and the stability of ellipsoidal figures of equilibrium, but also general relativity. During the period, 1971 to 1983 he studied the mathematical theory of black holes, and, finally, during the late 1980s, he worked on the theory of colliding gravitational waves. During the years 1990 to 1995, Chandrasekhar worked on a project which was devoted to explaining the detailed geometric arguments in Sir Isaac Newton's Philosophiae Naturalis Principia Mathematica using the language and methods of ordinary calculus. The effort resulted in the book Newton's Principia for the Common Reader, published in 1995. Chandrasekhar died of heart failure in Chicago in 1995, and was survived by his wife, Lalitha Chandrasekhar. In the Biographical Memoirs of the Fellows of the Royal Society of London, R. J. Tayler wrote: "Chandrasekhar was a classical applied mathematician whose research was primarily applied in astronomy and whose like will probably never be seen again." He was awarded the Nobel Prize in Physics in 1983 for his studies on the physical processes important to the structure and evolution of stars. He was, however, upset that the citation mentioned only his earliest work, seeing this as a denigration of a lifetime of achievements. It is not certain if the Nobel selection committee was at least remotely influenced in formulating this citation by the early criticisms of Sir Arthur Stanley Eddington, another distinguished astrophysicist of his time and a senior to him. His life's achievement may be glimpsed in the footnotes to his Nobel lecture. Chandrasekhar's most famous success was the astrophysical Chandrasekhar limit. The limit describes the maximum mass (~1.44 solar masses) of a white dwarf star, or equivalently, the minimum mass for which a star will ultimately collapse into a neutron star or black hole (following a supernova). The limit was first calculated by Chandrasekhar while on a ship from India to Cambridge, England, where he was to study under the eminent astrophysicist, Sir Ralph Howard Fowler. When Chandrasekhar first proposed his ideas, he was opposed by the British physicist Arthur Eddington, and this may have played a part in his decision to move to the University of Chicago in the United States. In 1999, NASA named the third of its four "Great Observatories'" after Chandrasekhar. This followed a naming contest which attracted 6,000 entries from fifty states and sixty-one countries. The Chandra X-ray Observatory was launched and deployed by Space Shuttle Columbia on July 23, 1999. The Chandrasekhar number, an important dimensionless number of magnetohydrodynamics, is named after him. The asteroid 1958 Chandra is also named after Chandrasekhar. ↑ Bio-Chandrasekhar Retrieved May 4, 2008. ↑ S. Chandrasekhar, 1983, Autobiography Nobel Foundation, Stockholm, Sweden. Retrieved May 4, 2008. 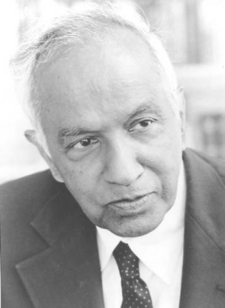 ↑ 3.0 3.1 Subrahmanyan Chandrasekhar Biography. School of Mathematics and Statistics, University of St. Andrews, Scotland. February 2005. Retrieved May 4, 2008. ↑ R. J. Tayler, 1996, "Subrahmanyan Chandrasekhar," Biographical Memoirs of Fellows of the Royal Society of London 42:81-94. ↑ Nobel lecture Retrieved May 4, 2008.